The boys are just starting to like this, but I can tell the boys are going to love it more and more as they grow. Love Adam's expression in this picture. The boys LOVE sitting in this bumbo, but only if it is where the action is! (Like on top of the counter when I am cooking or doing dishes). Here is Matthew chewing on his Pooh toy while mommy does chores. This has been a lifesiver!! The boys are too short to move the walker on their own, but with a belt attached to the top, it becomes a "mobile command chair" that can be easily wheeled around the tile. Both of the boys LOVE it. I put the other twin in the Moby wrap, and I can entertain two fussy babies without killing my back or my arms. It is wonderful! Probably one of the best things ever invented. With a little practice, baby can be easily held hands free. I can get chores done with this thing, and I can't tell you how much the babies love it. I can also take walks with a baby (if there is another person to hold the other), or use it in the grocery store. The one huge limitation though, is that I can only hold one baby like this. (Often combined with the above walker). Here is Adam in the Moby Wrap, showing off one of his preemie outfits to show how much he has grown. And the #1 thing I can not live without - Grandparents!! If I am ever overwhelmed, I can almost always call a grandparent over to help me out. Here is grandpa entertaining both babies. So sweet! 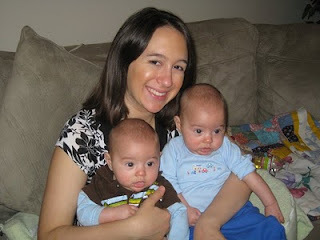 Children are a blessing, and I know I am blessed beyond belief that I have two healthy, thriving twin boys. As much as I love my boys, there are times I get frustrated (as I am sure all parents do). When both boys (or even just one boy) is happy/content, all is well in the household. But, when both babies are upset, it is hard on me (emotionally and physically) to calm them both down. Yesterday was just such a day. The boys were on a nap strike (2 of their naps were only 20 minutes long), and thus they were cranky and wanting to be held much of the afternoon. Well you may have guessed from my tiny arms that my bench pressing max in my glory days was 45 pounds. My triceps are non existent, and the boys have already wrecked their destruction on my back. So... not a lot to work with as far as holding two squirming 13+ pound infants together. (My arms get tired very fast.) Then with the short naps, I didn't get much of a break either. So, needless to say, I was a tad grumpy when Alan got home. Poor guy didn't even get in the house before I handed him a baby (Adam I believe). Alan had 10 days off of work during the holidays, and it was so so nice having him around to help with the babies. (Again, poor guy. He didn't get much of a vacation. :P) But it also may have spoiled me just a bit, because yesterday it was hard to go back to just me. The boys are 4.5 months old and doing great. (Adam on left, Matthew on right in above picture. 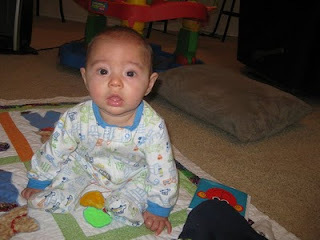 )At their 4 month check up Adam weighed 12 pounds, 8 ounces, 24 inches. Matthew weighed 12 pounds, 7 ounces, 24.25 inches. Both are in the 10th percentile for weight & length. (They weren't even on the chart when they were born, so this is good). We are still exclusively breastfeeding, and going strong. They eat about every 3 hours during the day. And every 4-6 hours or so at night (They have been waking up around 11:30pm and 4:30am, and I put them to sleep between 6pm and 7:30pm, depending on when their last nap was.) They take 3 - 4 naps a day. Their naps are usually 45 minutes to an hour. Occasionally the morning nap is a little longer, but sometimes the later naps are only 35-40 minutes. They are learning new skills all of the time, and they are developing their own personalities. Adam is our reserved, calmer baby. Matthew is our wild child.. he gets more upset than Adam, but he also smiles & laughs more easily. Matthew is our good napper. When we put him in his crib, he almost immediately puts his thumb in his mouth and goes to sleep. Adam seems to forget about his thumb when he naps, so he usually fusses for a few minutes before he drifts off. Above is one of their first tummy time sessions where they weren't completely upset about being on their tummies. (Adam on left, Matthew on right) They are also rolling from front to back like little acrobats :) They try to roll back, but they get halfway & get stuck. Here is Adam sitting up for the second time. I'm not completely sure if this counts, because he is not very steady, and I positioned him, but he stayed long enough for a picture :) This was yesterday. 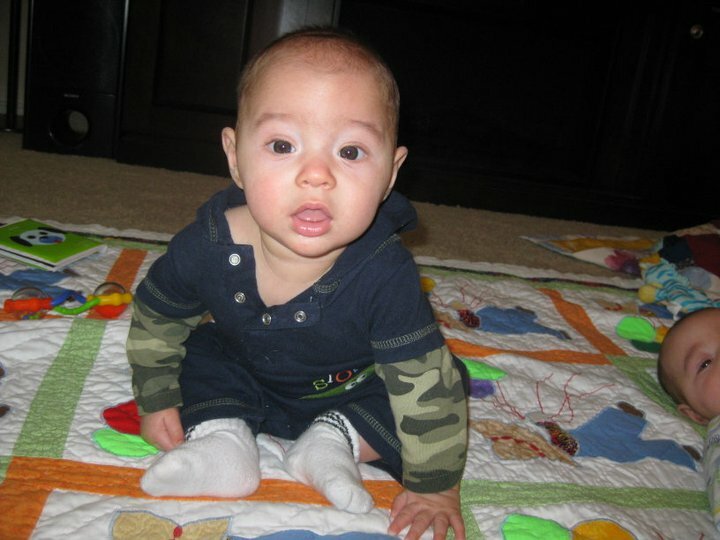 Matthew was able to pull it off as well :) I have such strong little boys! I am loving the 4 month age range. Adam & Matthew are just so so sweet. And I can't get over how adorable they are. Sometimes I just can't kiss them enough, they are just so lovable.